This event is SOLD OUT at all seating levels. Sign up for our monthly e-newsletter to be among the first to know when our events go on sale. Literary Arts presents The Nation Live! 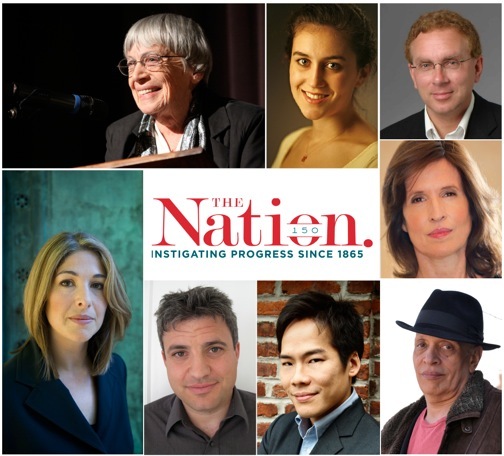 150 anniversary celebration, featuring Walter Mosley, Ursula Le Guin, Richard Kim, Katrina vanden Heuvel, Naomi Klein, Dave Zirin & Zoe Carpenter. Hosted by John Nichols. The year 2015 marks the 150th anniversary of The Nation, the oldest weekly magazine in the country. From groundbreaking investigative journalism, to cutting-edge cultural commentary, to unmatched political analysis, The Nation has been at the forefront of American politics and culture since its inception by a young group of abolitionists months after the assassination of President Lincoln. Learn more about The Nation’s 150th anniversary plans across the country at thenation.com/events. Chase Jarvis, Jack Liu, The Capitol Times, Baldomero Fernandez, Marcia Wilson, Shane Young, The Nation, Ed Kashi. 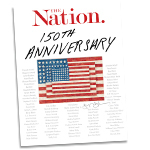 In addition to attending this event, take advantage of The Nation’s special 150th anniversary offer: $15 for a six-month subscription to The Nation and a copy of the commemorative issue.